Recently my friend Penelope took the opportunity presented by unseasonably cold weather to create a new hot coffee cocktail. I never drink real coffee (it makes me crazier), but the Thaw—with Godiva chocolate liqueur, Kahlua, and Bailey’s Irish cream sounded too good to pass up. So I bought a handful of decaf beans, ground them, and had hubby Bruce instruct me on the use of his French press. But while I was getting my coffee act together, I couldn’t resist experimenting with the brand new bottle of Godiva chocolate liqueur—a spirit that I’d never encountered before. 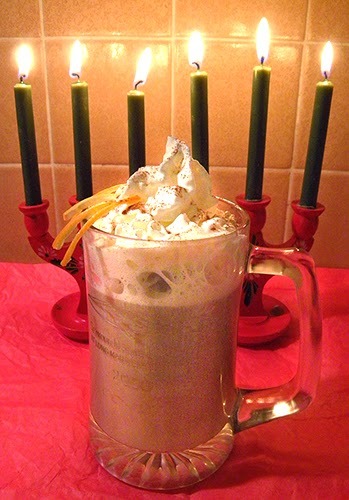 Having a bit of experience with hot cocoa toddy-making, chocolate seemed like the perfect foil for more chocolate—laced with a bit of alcohol. 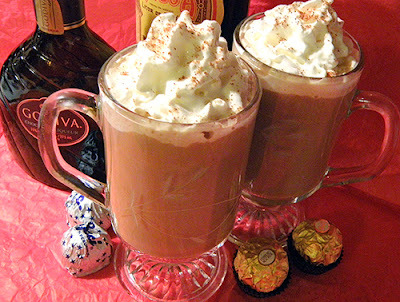 Mirroring Penny’s 3-liqueur Thaw, I added two other spirits to the cocoa and chocolate liqueur: Kahlua and Grand Marnier. Thus the Snuggle was born. A bit of a takeoff on the Snuggler—hot cocoa with peppermint schnapps—the Snuggle is perfect for cold winter nights by the fire, or curled up under some covers on your favorite piece of furniture. Both the Thaw and the Snuggle contain equal amounts of their respective liqueurs, but feel free to adjust the proportions as you like, or change the total amount of spirits to your taste. Because of the busy holiday season, I used a cocoa mix, but you can make cocoa from my hot cocoa toddy recipe or use your own favorite cocoa. For best results, don’t forget the whipped cream and garnish. Happy 5th day of Christmas! Preheat large mug in microwave for 1 minute, or until quite warm. Measure out cocoa mix into mug. Add boiling water and stir to dissolve. Add cream or half and half. If cocoa has cooled, microwave for 30 seconds or so. 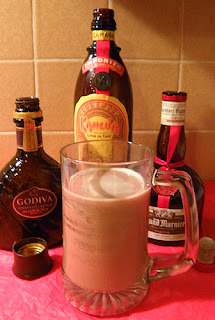 Stir in Godiva chocolate, Kahlua, and Grand Marnier liqueurs. Taste and add more liqueur/s if desired. 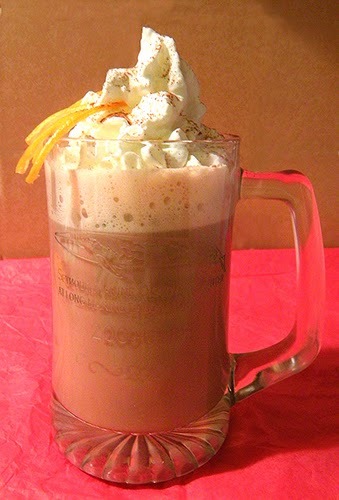 Top with whipped cream, a sprinkle or two of cinnamon, and a few strips of tangerine or orange peel. Preheat coffee mug in microwave for 1 minute, or until quite warm. Pour in coffee and half and half if using. Stir in sugar if using. If coffee has cooled, microwave for 30 seconds or so. Stir in Godiva chocolate, Kahlua, and Bailey’s cream liqueurs. Taste and add more liqueur/s if desired. 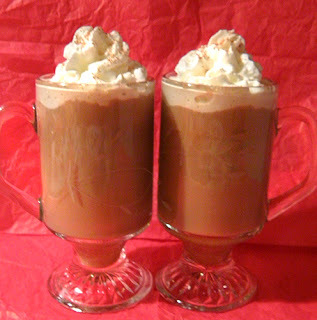 Top with whipped cream and a sprinkle or two of nutmeg. Kick back and enjoy!